A Guest is someone who has been invited into the community only to participate in a specific Room. Guests can participate ONLY in the Rooms they have been invited into they will not see any other rooms/content in the community. Once they have access to a Room they can participate in all the Activities and Missions. Guests can be made into Room Moderators by the Room Owner. A Community Member is someone who has been invited into community. Members have the ability to participate from top to bottom. 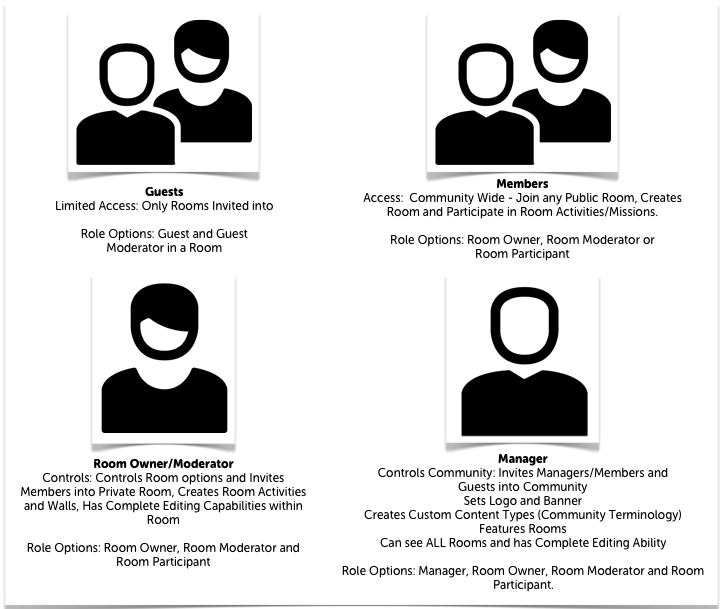 Members can participate in many ways including; Join any Rooms that are set Public, Create Rooms (be the Room Owner/Moderator), as a Room Owner/Moderator they can create Activities, Walls and add Assets (Images, Videos, Links, Documents and Custom Assets) to Rooms they are participating in. As a Member you will need to "Join the Room" to participate if the room is set as public and you haven't previously been added as a participant. The Community Manager has all the member capabilities plus the ability to Invite Managers/Members and Guests to the Community, create Custom Content Types, Feature Rooms, view all rooms irregardless of privacy setting or ownership. The Community Manager also has complete editing capability within the community.